Johann Schantz (1762-1828) was born in Bohemia (now Czech Republic). During the 1780’s, he and his older brother Wenzel established a workshop in a suburb of Vienna. Since none of them yet were certified organ and piano builders, they probably produced their first series of instruments without signature. After Wenzel’s death in 1791, Johann finally received all necessary documents for opening a certified workshop in Vienna. Ludwig van Beethoven described the Schantz pianofortes as good and durable and he recommended them to his friends. Another customer, Joseph Haydn, often spoke about them as more expressive than others. The Schantz pianofortes are regarded as the most appropriate instrument available today for interpreting Haydn's music. Schantz made certain improvements to the pianoforte and introduced the divided bridge and individual checks to the Viennese instruments. 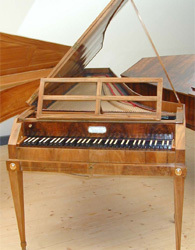 Like many other pianofortes of its period, it is very lightly constructed and has much smaller hammers and thinner strings than a modern piano. The physically modelled virtual copy for Pianoteq is based on the original instrument from 1790, displayed in the Schloss Kremsegg museum in Kremsmünster, Austria.